Published Friday, April 16, 2010, OK personal/derivative use; link www.lovethatimage.com. These were taken by my sister when we visited the tulip festival last week. I think hers are pretty wonderful. I wish I took that top one! Please visit Macro Flowers Saturday, Color Carnival, Pink Saturday, Shadow Shot Sunday and Scenic Sunday after your visit here. Remember, you can always click on Sara’s Fave Photos above to return to the full blog with my latest post on top. This one below is of me. These are incredible! A photographers dream come true! Such wonderful colors. Good job! Great shots. We have a smaller version down here but the Skagit Valley wins by far. I miss living in such diverse scenery as in that area. Beautiful tulip macro, Sara. Do they plant these bulbs by some mechanical means? Excellent tulip macro Sara, what a beautiful light and details. These tulip fields, in so many colors, are sensational, especially with this beautiful background of mountains and sky. I am in greater “awe” with every post of these wonderful tulips! The light in the first one is breathtaking! 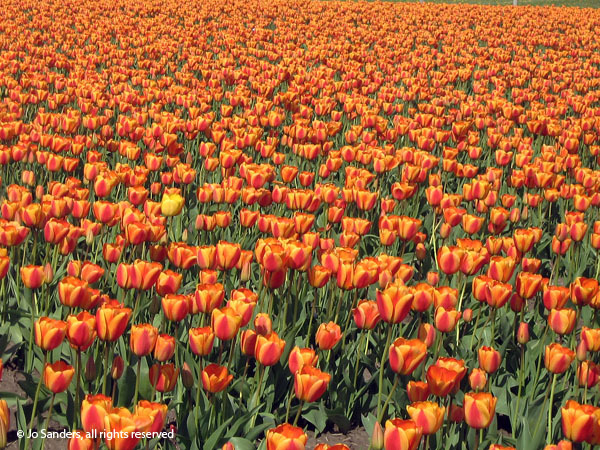 The one yellow in that sea of orange is really something special and the last shot is another “awe” inspiring photo! Wow! Just beautiful, what a beautiful sight to see all the pretty tulips. Wonderful photos. Oh i love the tulip Fields with the mountin in the background, its stunning! Great shots. They remind me of when I lived in Holland, with the fields of flowers they have there. But the mountains in the last shot look nothing like Holland. Wow! Great macro and the second picture i just fantastic as well. So many tulips in one place, it’s amazing to look at. Fantastic shots as always, Sara! The colors and tulips are breathtaking. Love the shot of you taking a shot!! We do get in some interesting positions as we capture the beauty, don’t we? Love your macro shot, too! Hope you have a great weekend! I haven’t seen such an expansive flower farm up close, but the rows and rows of beauty leave great shadows aver the furrows. The bold colors ore wonderful, I usually see one or two colors, but here so many shades are so nice. Excellent capture – Spring awaits! I would want to lie down in those fields and enjoy the beauty! The last shot is my fave…a woman in love! What wonderful fields with Tulips ! lovely spring flowers and that first one is a dream of a shot..
Pls bring me there. Love tulips and the color is heavenly beautiful. I just want to lay down in that second picture and soak up all the color! You live in such a wonderful place to have so many tulips to photograph. It’s a magical valley, that’s for sure. Tulips are among the most beautiful flowers that I’ve seen. Thanks for sharing with us these lovely pictures. A wow for you. What a beautiful photography of the tulips. Never seen that huge flower garden. Interesting. Gorgeous fields of tulips! 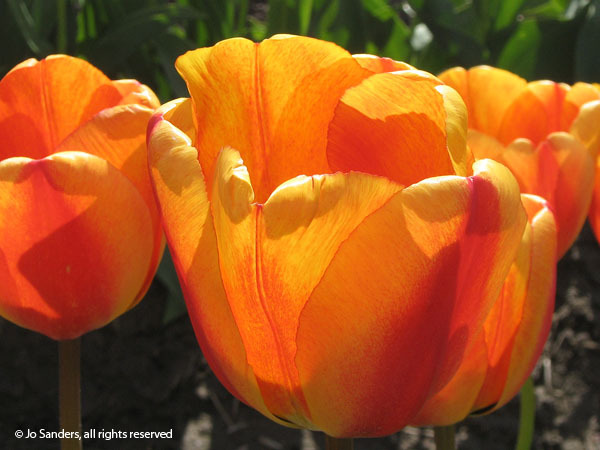 The orange ones are fantastic..
One of my favorite flower Tulips….Happy SS! 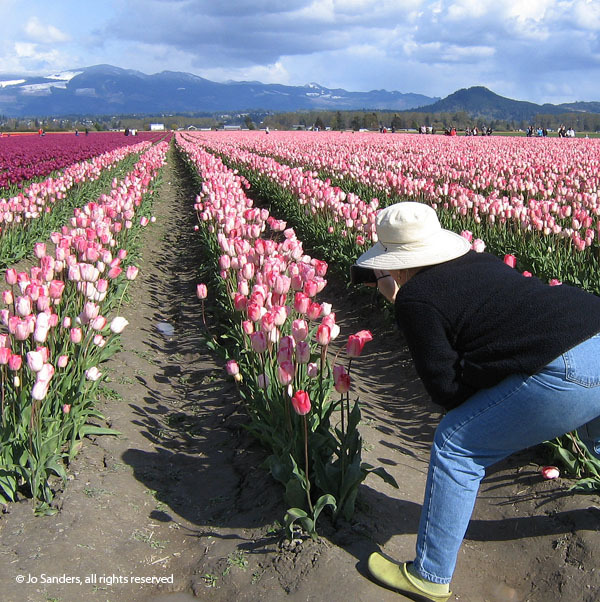 What beautiful tulip fields! So wonderful, what a great place to spend the day! Incredible field of flowers! I want to be there too. Those are some very pretty blooms. Love the macro. This surely a festival not be missed.